If you are focusing on your wellness, then Iridology may help. By studying patterns, colors, and other characteristics of the iris, Iridology practitioners can glean insights about a patient’s health, which can improve quality of life. In this introduction and explanation to the art and science of Iridology, the author—who was named the International Iridology Practitioners Association Iridologist of the Year in 2016—traces the history of the science, from the father of modern Iridology, Ignatz Von Peczley, to the present day. Filled with color photographs, charts, diagrams, and room to take notes, the book includes a Body Systems Companion to aid in a thorough understanding of how concepts in Iridology relate to the physical body as well as study questions at the end of each chapter. Iridology Fusion explains the workings of Iridology for certification purposes. It is the complete text-workbook for anyone learning Iridology plus, this book is approved by IIPA for Level I and Level II curriculum. https://www.lulu.com/shop/kathy-k-norris-dir-ccii/iridology-fusion-worktext-and-systems-companion-guide/paperback/product-23862960.html / This Link Leaves IIPA. It covers all of the major topics required by the International Iridology Practitioners' Association (IIPA) for basic certification in Iridology. It is one of several books available, and while it covers the syllabus requirements for certification, it includes discussions of Rayid and Chakras which are not part of testing requirements. It can be studied as a practice manual, but also used as a textbook by any teachers wanting to prepare their students for the IIPA Certification Examination. The book has full color pages and iris photographs. 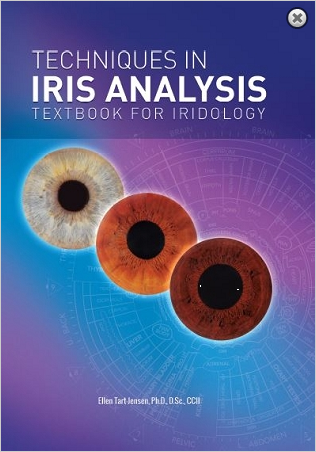 https://www.amazon.com/Iridology-Textbook-Curriculum-Analysis-Certification/dp/1502492709 / This Link Leaves IIPA. iridologyonline.com/product/integrated-iridology-textbook-hard-cover / This Link Leaves IIPA. bernardjensen.com/Techniques-in-Iris-Analysis-Textbook-For-Iridology_p_547.html / This Link Leaves IIPA. Suffering scoliosis and chronic pain, fatigue, and depression due to a back injury, Ellen Tart-Jensen became determined to take charge of her life. She began researching natural health care and discovered that by listening to one's body and following nature's simple laws, health is attainable for everyone, herself included. Now a nutritional consultant and certified iridologist, she's at her absolute healthiest and travels the world coaching others in self-care. HEALTH IS YOUR BIRTHRIGHT is a roadmap for those looking to take charge of their ailments, or at least lead a more balanced, vibrant lifestyle. It is filled with a wealth of tips on nutrition, therapeutic teas, exercise, cleanses, and more. Book Excerpts from "Health Is Your Birthright – How To Create The Health You Deserve" The nutritional plan I offer here has helped hundreds of people drop excess pounds, maintain their normal weight, feel energetic, and heal a majority of the health problems they were experiencing. bernardjensen.com/HEALTH-IS-YOUR-BIRTHRIGHT-BY-ELLEN-TART-JENSEN_p_109.html / This Link Leaves IIPA. bernardjensen.com/The-Simplified-Guide-to-Iridology-_p_549.html / This Link Leaves IIPA. iridologyonline.com/product/fundamental-flashbook/ This Link Leaves IIPA.